Hi all, I'm looking into using a Panasonic VEQ series viewfinder (DVCpro AJ-D800) on a different model camera. However, I have been unable to find the pinout. 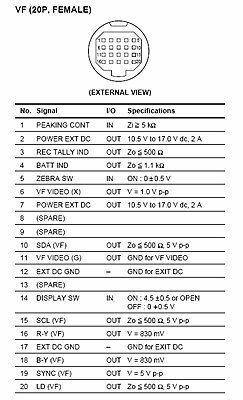 Sadly unlike some other manufacturers Panasonic guards it's service manuals quite well, does anyone know what the pinout should be? Right, found the Sony viewfinder pinout (both older 8 pin DXF-40/501 and the newer 20 pin DXF-50/701/801 style).. Going to try and see if the Panasonic pinout matches up to that, or atleast the parts that matter to me. 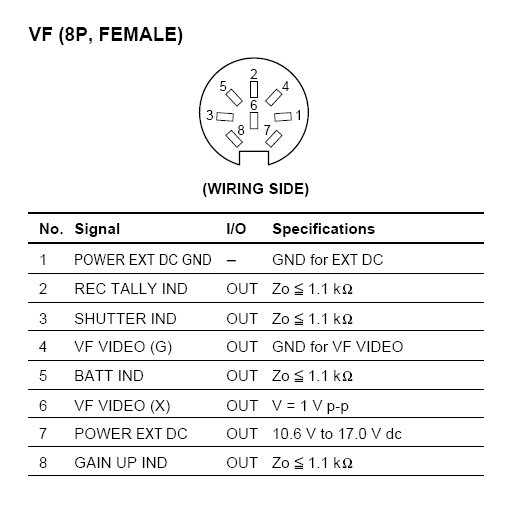 Which would be the 12v input and ground, and the composite or Y input and ground. Ok we compared the pinout on the Sony and the Panasonic and they don't match up. The odd thing is that through 2 pins 14.4 volt goes to the Panasonic viewfinder, yet the CRT tube runs off another pin, which has 9v. So I have no idea what it uses 14.4 for. We also managed to get a composite signal on it, but it seems the composite signal was too strong and it's slightly random whether it pops up or not. 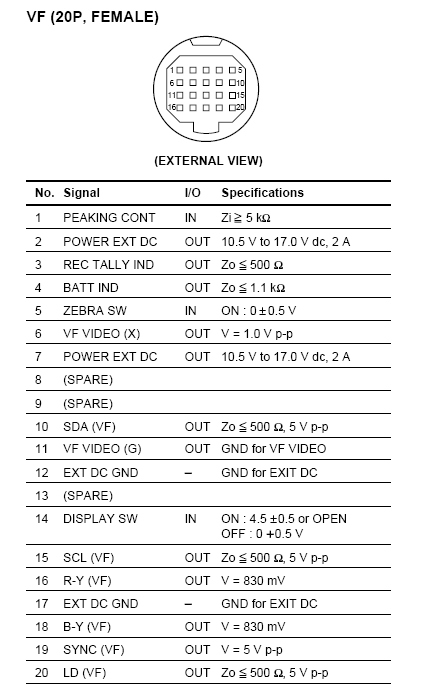 Attached are both the 8 pin Sony viewfinder pinout and the 20 pin pinout. They came from a Sony DXC-D35 service manual and are camera side.